Let’s just preface this whole review by saying, if you liked the episode where Yugi battled Duke Devlin while playing Dungeon Dice Monsters (DDM), then you’ll probably like this game. I’m not going to explain how DDM is played in this review. Duke Devlin did a much better job explaining how to play this game during the Anime than I’d ever do. I actually thought it was amazing how good of a teacher the Duker actually is! I’m just going to tell you my thoughts on the game. 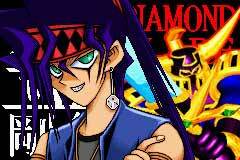 First off, the game is extremely faithful to the episodes in which YuGi & Duke battled. You select dice. You roll dice. You summon monsters. You dimension your monsters. You move. You attack. You block. Basically everything you saw in the show happens in the game. Some of the things I found interesting in the gameplay that weren’t noted on the show. Some monsters have flying, and can fly over enemies on their path. This uses more “movement crests” than a usual move, but can be helpful. And in the same fashion, some monsters have a digging ability that lets them tunnel under monsters. Also, there is one more way to win besides attacking your opponent's “3 hearts”. If you summon all 5 pieces of Exodia, you automatically win. Game play on the Game Boy is pretty straightforward. This game is easier to learn than Duel Monsters. I’d keep the instruction booklet handy the first couple of times you play a match. As it can be confusing to understand the controls, but once you do, the game is very simple to play. If any of your monsters have special abilities (example: increase attack power, or defense), you will be prompted as to whether you want to use these abilities prior to attacking, or getting attacked. Pretty nice. 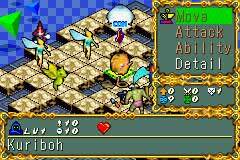 Sound & Graphics are about what you expect for the GBA. When monsters attack, an animation will show your dragon (or whatever monster you are attacking with) attacking the defender. What’s nice is that Konami gives you the ability to shut off this redundant animation if you are sick of seeing it. Like I said above, if you liked the episode where Yugi battled Duke Devlin while playing DDM, then you’ll probably like this game. If you thought the game was stupid compared to Duel Monsters, stick with the electronic CCG versions. There is essentially no storyline whatsoever, which I find somewhat disappointing. You just jump right into tournaments. I still give this game a thumbs up though. DungeonDice Monsters Game: This expandable game system has hundreds of characters and monsters to conquer with skill in combat. Defeat an opponent’s Dungeon Master and emerge victorious. The game includes 11 monsters, cards and paper dice, 10 gems, an abacus, a play mat and rulebook. Roll the dice to activate the monsters and collect various game tokens. Each time a monster is activated, unfold its die and lay it out on the mat. Create a path to the enemy’s Dungeon Master and defeat him to win.